The Surf Hotel offers an authentic Moroccan surf retreat which is perfect for beginners and intermediate surfers. 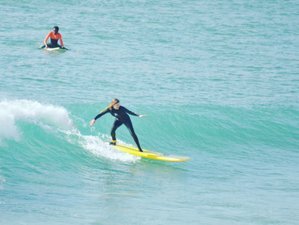 The experienced surf instructors will bring guests to the best surf spots according to the surfing skills and surf conditions. The optimal wave and wind conditions will enable guests to make huge advances in surfing and improve skills to the next level. The instructors will explain the theory and execute the practice throughout the course. The guests will initially surf in the white waters and eventually catch some green waves for a great surfing experience! The Surf Hotel Morocco is the perfect home during the retreat. It is a newly opened surf hotel located in the middle of surfing areas just a few minutes walk from the famous Devil's Rock. Surfing spots like Banana Beach, Hash Point, Anchor Point, Anza, and Killer Point are in short distance by car too. The hotel can comfortably accommodate up to thirty people maximum. The Surf Hotel Morocco offers spacious and comfortable double or twin rooms, beautiful suites, and a shared dorm room with five beds (no bunk beds). All rooms have an en-suite bathroom to offer you more comfort and privacy. Enjoy the high quality of the hotel, relax at the air-conditioned lobby, or chill on the large and sunny rooftop terrace with magnificent view over Tamraght village. The hotel offers some homemade tajine for dinner and you may simply enjoy the classic Berber whiskey. Get comfort from the high quality service of the hotel and get mesmerized by the sea horizon. Itinerary may change according to weather, tide, or swell conditions. An experienced and professional surf instructor, Lokmane has been surfing all his life and still loves to surf. He stopped working at his office job as he really wanted to spend all day to share his passion for surfing with The Surf Hotel's international guests. He always looks out for the best waves to let you make a huge advance in surfing. Surfing with Omar is always a lot of fun. He is a good motivator and knows every hint and tip to improve your surf style. While surfing with him, you will improve your surf very quickly and enjoy every single minute in the water and on the beach. Abdellah teaches surfing with humor, a lot of energy, and an endless smile that will take away every fear you probably have. He knows every tip to improve your surf skills and he will always bring you to the best waves according to your surf level. The Surf Hotel Morocco is located in the hills of the Tamraght Oufella between Agadir and Taghazout. The Surf Hotel is surrounded by many famous surf spots. From the hotel's beautiful rooftop terrace and ocean view, guests can enjoy the sight of the charming surfer village, the morning waves, and the stunning Moroccan sunset. During the stay, guests are provided with healthy and tasty meals. In the morning, guests will enjoy the delicious breakfast variety with fresh coffee, Moroccan mint-tea, fresh juices, and other various food. For lunch, guests will have a tasty salad, pasta, or sandwich by the beach. Not to mention the three-course meal at dinner time, which is the highlight of the entire day. Chef Abderahim creates fresh and delicious meals with local products six days a week. The Surf Hotel Morocco has built a professional and high quality surf camp in Morocco complete with comfort, delicious food, and hospitality.